One Click Safety is a student-developed app. Its idea is to make users feel and be safer with only one click. Our app includes three buttons. The first button starts a loud alarm that can only be switched off by entering their chosen passcode. 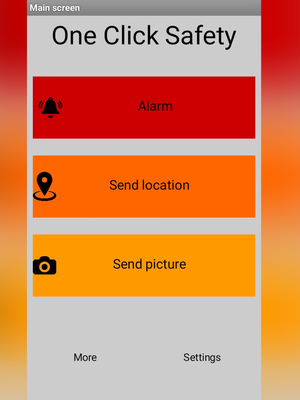 The second sends the users location to the person’s emergency contacts with a pre-configured message telling them the user is in potential danger. The last button automatically takes a picture from both the back and front cameras and sends them to the user’s emergency contacts and saves the pictures on the user’s device. L.A.S.H. earned 10 points for their code checklist. We used a string to set and let the user edit the emergency message. We used a number to see if the password had four characters or not. We used a variable called contacts that included a list with the user´s emergency contacts. We stored the user´s emergency contacts in a list. We save the user´s emergency contacts here. 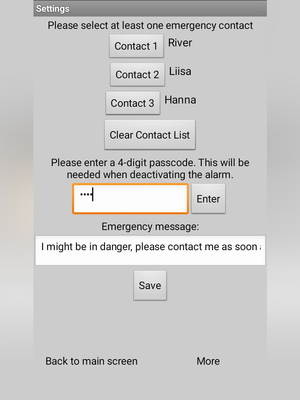 We used text messaging to send the user´s emergency contacts an emergency message.